BATTLE CREEK, Mich., Oct. 19, 2018 /PRNewswire/ -- This season, transform your favorite holiday treats, menus and gatherings with the perfect unexpected ingredient: Kellogg's® cereal! Kellogg's is partnering with cookbook author and culinary expert, Padma Lakshmi, to host a cereal-centric baking competition and crown the next "must-make" holiday dessert. Lakshmi will host Kellogg's Holiday Baking Challenge at Kellogg's NYC Café and judge desserts made by four finalists. Using their creativity, bakers will feature one or more Kellogg's cereals as a key ingredient in their dish, making the holidays even more delicious. The Kellogg's NYC Café will be transformed into a modern "bake shop" to inspire the bakers and their creations, showcasing the deliciously endless possibilities that can come from an item everyone has around like cereal. The competition will take place on Wednesday, December 12 and Lakshmi will be in attendance to taste each cereal-themed dessert before announcing the winner. The winning baker will receive a one-of-a-kind trophy and their recipe will be featured at Kellogg's NYC Café and on KelloggsNYC.com to be recreated anywhere. To enter Kellogg's Holiday Baking Challenge and for additional details, bakers can visit www.kelloggsnyc.com/holiday and submit an entry by Friday, November 9. Kellogg's NYC Café is located at 31 E 17th St. in Union Square. For more information on how to reimagine your favorite bowl of Kellogg's® cereal at home, visit the Kellogg's® NYC Café website, or on Instagram, Facebook or Twitter. Emmy-nominated Padma Lakshmi is internationally known as a food expert, model, actress and best-selling author, as well as the recipient of the 2016 NECO Ellis Island Medal of Honor and Variety's 2018 Karma award. Lakshmi serves as host and an executive producer of Bravo's Emmy award-winning Top Chef, which is currently in its 16th season. Lakshmi established herself as a food expert early in her career, having hosted two successful cooking shows and writing the best-selling Easy Exotic, which won the "Best First Book" award at the 1999 Gourmand World Cookbook Awards. Lakshmi followed this success with the publication of her second cookbook, Tangy, Tart, Hot & Sweet. In 2016, she released her food memoir, The New York Times best-selling Love, Loss and What We Ate, which also won "Best Lifestyle, Body & Soul" at the 2017 Gourmand World Cookbook Awards, followed by The Encyclopedia of Spices & Herbs. In addition to her work as a writer, Lakshmi is a savvy businesswoman, having had multiple companies of her own, including her home décor line, The Padma Collection, and Padma's Easy Exotic, a collection of frozen rices, lentils and other culinary products. In Spring of 2018, Padma collaborated with MAC Cosmetics for a worldwide capsule collection called #MACPadma. Last year, Lakshmi became an ambassador for the ACLU, focusing on women's reproductive health and immigration issues. She is also co-founder of the Endometriosis Foundation of America. The EFA has educated over 32,000 teens on this devastating illness. NO PURCHASE NECESSARY. A purchase will not improve your chance of winning. Void where prohibited. 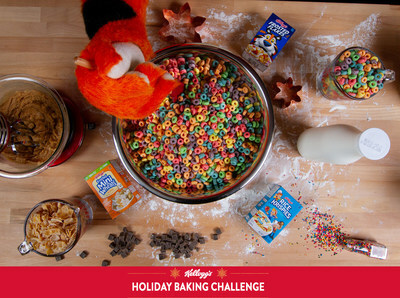 The Kellogg's Holiday Baking Challenge is sponsored by Kellogg Company. Open to legal residents of the 50 US & DC, 18 & older. Recipe Submission Period begins 9:00 a.m. ET on 10/19/18 & ends 11:59 p.m. ET on 11/9/18. 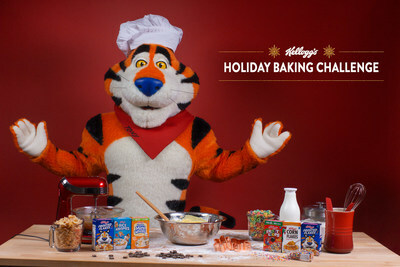 For official rules, visit http://kelloggsnyc.com/holiday.